It wasn’t until today, after reflecting on a stressful week last week, that I realized how I needed to shift that mindset. It’s three months post-LifePlan for me. I’ve been reflecting on my the event and my LifePlan, self-assessing where I’m at. The truth is I’m flawed and some weeks I do better than others. Work demands led me to putting in a lot of hours last week, at the cost of exercise and other things that refuel me like reading and writing. We dove into a weekend with a full schedule. Saturday night hit and I was spent. I hit my point where stress was allowing victim thoughts to enter my thought pattern. I intentionally did three things that changed that. I flipped through Rory Vaden’s book, Procrastinate on Purpose. I read these words. You need to free yourself of the need to feel like you have to be everything to everyone. You have to let go of the absurd idea that you owe everyone an explanation. You have to learn to flat out Ignore certain things. If the only reason you are doing something is because you feel obligated just because someone asked you to do it–don’t do it. I was busy at the time, in the midst of “finally” doing duties around the house (something I had neglected throughout the week). But, I put these thoughts in the back of my head. I listened to Michael Hyatt’s podcast, “How to Finally Achieve Work Life Balance” during an early morning run. I was reminded of what this means to me…my belief that work life balance is living out my values. Honesty with myself, led me to admit that I didn’t live out my values last week by neglecting being a good steward with my physical health and allowing work to consume me. (Which caused frustration with myself because in LifePlan I said my number one thing that caused me to put my breaks on in life is my health–when I’m not taking care of myself, everything suffers). Granted, there were things with work that had to be done, but I was not strategic enough in setting up my schedule in the first place. The most important intentional move I made of the weekend….saying no to some things Sunday afternoon that were not priority (despite the fact that they felt demanding) and I retook control of my life–control I had given away. I put on my running shoes and hit the asphalt. I came home and prepared healthy lunches for the week. And, I spent some time alone refueling. Did that mean I didn’t get work done? That is true. But, my mindset is healthy and ready to take on the week. And, I’m no longer a victim. As I mowed the yard Sunday evening, it hit me. What I said in LifePlan was wrong. I don’t want to master life. I can’t control “life” as I had it defined in that statement–outside influences. I want to master me. Because here’s the thing. We are human. We are flawed. We become stressed. We are challenged. We even sometimes have to fight a victim mindset. But, we have so much more power than we claim to. We have power over our thoughts. We have power over our victim mentality (even in the midst of stress, which is when it creeps in on me). We determine our actions. 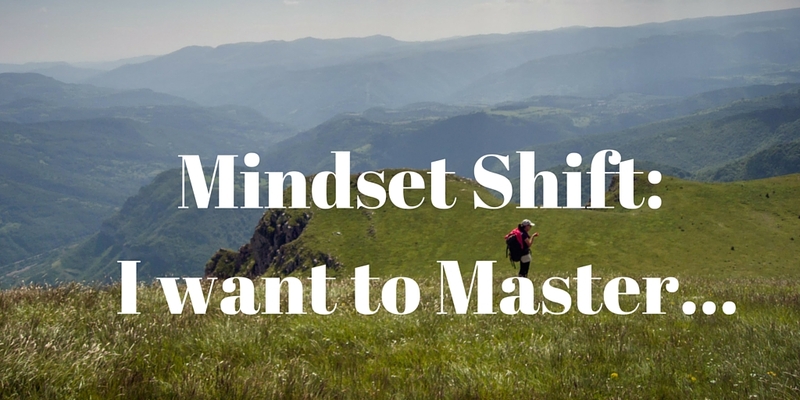 We have the power to shift our mindset.We have the power to live our values. We have the power to master ourselves. It was time to go to the doctor. His eyes were red. His nose was a faucet and the sneezing was continuous. My son, Jonas, had never had allergies before, but clearly something was going on. Despite it all, he was his typical happy-go-lucky self. As we approached the desk of the receptionist, I didn’t get a warm and comfy feeling. I got a terse “Who are ya seeing?” I heard a huff and a puff as she pecked at the keyboard. And then Jonas looked at her with his red poofy eyes and light-hearted spirit and smile and said “What’s your name?” This changed her world. She replied with her name and it was as if she snapped back into reality. She admitted she wasn’t feeling good and that was the first time she smiled all day. She thanked Jonas. One moment. One simple question. One simple smile. (Okay, and maybe the dimples on a two-year-old, curly-haired blonde). But, ultimately, it was one human yearning for connection and reaching out in a way that altered the other’s day. 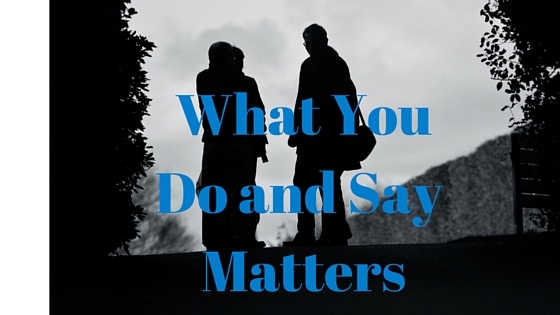 What we say and do matters. “I am proud of you,” was not a phrase I heard often. Because of the root system of those around me, I really was left to navigate through ups and downs of high school and life by myself….along with a key mentor, my coach. Because I was immature, lacked guidance from home in how to navigate through life, and still hadn’t shifted my mindset to be completely healthy yet, I struggled through high school basketball, even considered quitting at one point. Through discussions with my coach/mentor, I battled through and got a taste of parental guidance. Following the last basketball game of the season, I was walking to the bus for the return ride home. My coach caught me, looked me straight in the eye and with such conviction said “I am proud of you.” I can still feel to this day, the feeling I had from those five words. Then, I started thinking, how have my words and actions impacted others in my life? Here’s a couple that come to mind. In college, I was a sports and news reporter for the local paper. At the time, I was thinking I was going to be a high school teacher and softball coach. I began writing a sports editorial for our paper. Looking back, that was about me. I wanted to share some thoughts and knowledge about the subject. I wondered if people would read my stuff and what they would think. And, one day, I received a three-page hand-written letter from a coach who had retired from the local school district. He replied to much of what I had written in my editorials and then thanked me. My writing was rekindling something in him that was his passion and he was connecting with it again. My editorial was not just about me. I used to coach a competitive softball league for high school girls. One of my parents, out of the blue one day approached me and said thank you. I assumed it had to do with coaching her daughter, but it did not. “Thank you for all the running you do. You inspire me and now I am running, too, and I feel great!” She went on to explain that she would see me out running through our small town, which in turn caused her to do some reflecting on her life. I thought my running was just about me. It was not. Here’s what I know to be true. Our words and our actions, impact others. That makes sense right? It doesn’t take much to understand that. What if we lived every day, every moment knowing that our words and actions impact others in profound ways? Would we change how we walk? What we say? Whether we smile at others? Whether we call someone by their name? Whether we lace up our shoes and get outside to run? Whether we express gratitude to others? Whether we extend grace? Etc, etc, etc. Your life matters. It matters every second. And, not just for you. It’s about you, but it’s also bigger than you. I am the writer of my life. I have choice in my setting. I choose the home I live in, based on my values of living debt free and close to family.That means I am choosing to not live in my dream home yet. I choose my place of refueling–outside, in the solitude and quietness of the morning. I choose the place where my talents benefit others. For now, that is a school setting, and specifically in a classroom so that dialogue about students can take place with teachers. I choose the characters written in my story. I choose my significant other who I will walk through life with. I choose him daily because of who he is. I choose him in the good times and bad. I choose to bring children into our life. I choose to make our son one of the most important people we pour into. I choose my mentors, both face-to-face and the ones found in books and virtually. That means being proactive about contacting mentors of my past. And pursuing mentors of my present. I choose my friends, who add value, joy and connectedness in my life. I choose my mastermind, a group of ladies who hold me accountable and celebrate my successes. Within the pages of my book is the plot of my life, constantly being reaped in the small habits that I partake in. Sure, I didn’t choose my very beginning, the family I was reared in or their values. But, I did choose to allow them to impact me in a positive way or not to allow them to impact me in a negative way. I chose to study hard, work hard and be my own person in my K-12 education and athletics. I choose to exercise on a consistent basis. I choose gratitude in the small moments of the day. I choose to lead myself and thus lead others. I choose to see the beauty in the pain. I choose to see the beauty in others and in myself. I chose humbleness and confidence. I choose courage to be honest with myself. I choose to believe that I have significance that is special and unique and will lead to the climax of my story. 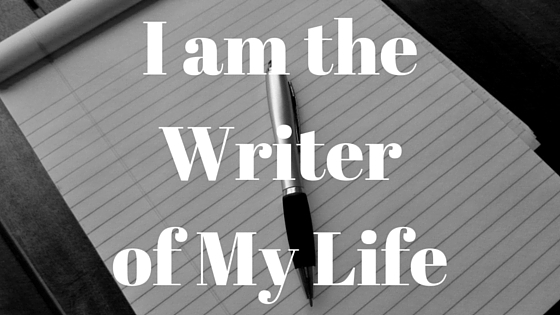 I am the writer of my life…and look at the degree of choice I have in it all. That’s what I heard on my drive to work as I contemplated what small thing I could do that day that would have a big impact on my ability to lead others. 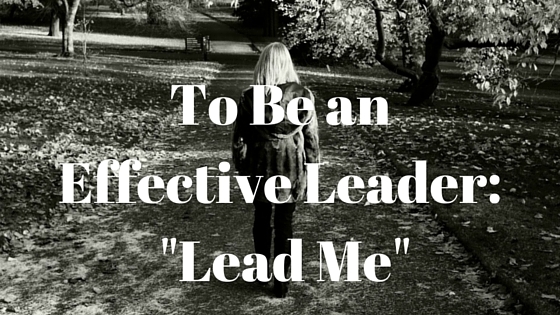 “Lead me.” I wondered, at first, would that be “enough.” to effectively lead others that day? But, then I paused and considered some of my core values. What I believe…no, what I know to be true is that if I am living by my core values, then I am truly leading myself. The question is this: Would that also be leading others? Let’s consider some of my core values. 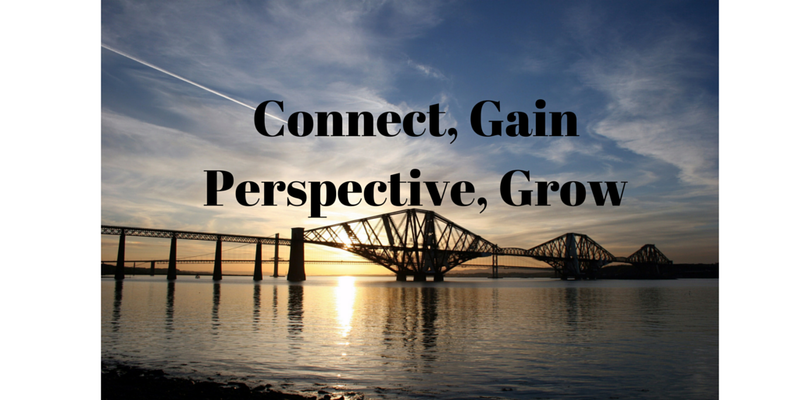 Confidence with humility – If I exhibited confidence in the knowledge that I had, while showing humility and a growth mindset with what I didn’t know, would I be leading that day? Of course I would. Stewardship – If I kept a focus that day on serving others, contemplating how I could add value to their life, would that be leading others? Yes, it would. Authenticity – If I focused on being my true self, capitalizing on my unique strengths and knowing that who I was and what I could provide was not only “enough,” but also “effective” in my role, would that be leading others? That is also true. Courage – If during those times of the day when a tough decision had to be made or I had to navigate a difficult conversation or I had to have the courage to do any of my other core values, would that be leading others? It would, because a leader has to exhibit courage, even if standing alone. After considering just these core values, it was evident to me that what I was hearing (“Lead Me”), was indeed my path to being a great leader. If found this interesting and powerful. So much of what I listen to and read on leadership is focused on systems thinking, on navigating the personality of others, on the change process, etc. All that is important as well. But, if we’re not leading ourselves during those small moments of the day, we’re not leading. What are your core values? Let them be your guide. Because whether you’re a leader by title or not, you are a leader in some capacity (a father, a mother, a friend, a neighbor…all our roles have a component of leadership). We live in a society of bold statements. We like bold statements. They elicit our emotions. They give us the perception that someone is a leader. It can even yield group think. What if, instead of bold statements, we asked more questions of ourselves, of each other, and of the ideas and beliefs we hold? Would that not allow us to grow more? Even, if we don’t agree with the answer? I find this to be true in my work as an instructional coach. Upon entering this field, I felt I had something to offer. I had knowledge due to my voracious reading and passion on the topic of reading and instruction. It was my opportunity to invest in others by sharing that knowledge. I’ve learned coaching is so much more. In a nutshell, the most effective coaches ask questions. It is during these conversations that those who I coach grow the most. It’s when I don’t offer them all the answers, but allow them to do the reflecting. Wouldn’t it be quicker to just tell them what they need to know? Sure, and sometimes the situation necessitates that. But, are we going for quicker or more effective and lasting impact? When I facilitate questioning in a way that allows them to have their own aha’s, the impact is permanent. When, I tell them what they “need” to know, the impact is short-lived. Applying this to my personal life, I would say this. I could easily make bold statements about who I am and the beliefs that I hold. But, there’s no growth in that, because I’m discussing the truths I already know or the truths as I currently understand them. But, if instead of that, I challenged myself with questions about my talents, my beliefs and the direction in my life, would that not lead to more growth? For example, I could quickly say “courage” is my top core value, because it allows me to attain my other core values. It’s a simple, yet bold statement that….stops right there. Or, I could ask myself: How am I applying courage to my everyday life? Did I have courage when I was challenged on a topic at work? Did I have courage to address a difficult conversation with my husband. Did I have courage to entertain the possibility that I could be wrong about something? 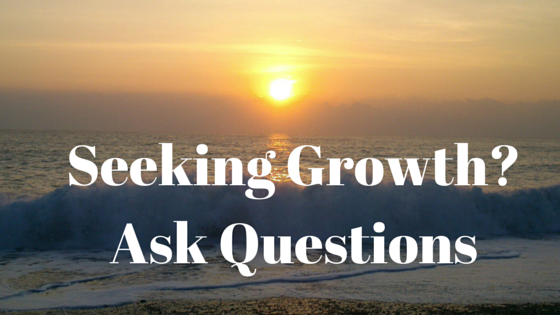 You see, it is these questions that allow growth. Not the statements. What questions do you need to ask yourself today? What questions do you need to ask your team? What questions do you need to pose to your spouse? Why Not Run in the Rain? It was the last run of my summer before I returned to work as an instructional coach. It was early morning, the perfect time to turn on the podcast, hit the road and just “listen” to what my life was telling me in my pursuit of truth. I put on my headset, turned on the podcast and said “a few sprinkles of rain” aren’t going to stop me. About a mile and a half in, it was pouring. No biggie. I could just run back to the car and finish exercise on the treadmill at home. I arrived at the car, rain running down my face, clothes wet and started the car. Then, something caused me to pause. Think of the advantages. Sure, I couldn’t listen to my podcast, but I could feel the rain running down me (something we all love to do as kids) and finish my run. So, I did. And I “heard” two things as a result of embracing that moment. 1) Why do we let “rain” stop us in life? Sure, it was annoying to have my clothes sticking to me. I couldn’t listen to my podcast. My run was interrupted. A bug even flew up my nose. But, there was great joy in the moment because I wasn’t going to let a curve ball thrown at me disrupt my plans. I ask again, why do we do that in life? Let’s not let stress stop us. Or doubt. Or fear. Or hard work. Or disappointment. Instead, know what you value. Know the investment and what it’s worth. And embrace the struggles. Who knows, you might even enjoy overcoming them. 2) I rarely stop to walk when I run. I’m there to run, to push myself. But, I felt compelled to walk in the rain towards the end of my run. What I “heard” was “slow down and listen.” So, I did. You see this summer, I think, will be one of the biggest turning points in my life (the reasons outlined on this blog). I was overcome with gratitude that an opportunity to recognize my root system and it’s impact on me presented itself to me this summer. I was thankful I was drawn to that place in Franklin, TN. Thankful for my facilitator, for the brief moment in time when he played a significant part of my life. Not only that, but the revelations and people who “showed up” in my life after that; people with a message that would facilitate my journey further. And finally, thankful for my focus on the truth. Life is filled with precious moments, moments that bring us richness so that we can then bring richness to others. I walked in the rain and just felt the gratitude. 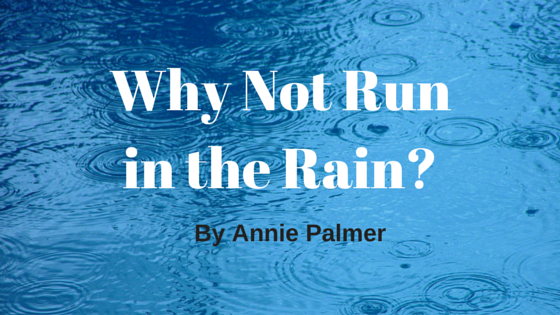 So, why not run in the rain, literally and figuratively. Embrace is for all it holds. And, when life tells you to pause and listen, do so. This was one of the quotes I put in my senior autobiography our high school English teacher asked us to write. I’ve always used this belief as a foundation on which to build my life. As I was reflecting today over the last 4-5 years, and particularly this last year, I am amazed at the opportunities for growth that came about in my life because of technological advances in our society. I’ve wondered why mentors came in an out of my life and honestly, it has bothered me at times. With the lack of parental presence in my life, I learned to become independent at a young age. I was able to find mentors through athletics and my work. As my life took a different path, I had to fill my yearning for wisdom and perspective elsewhere. Books were the next logical progression. These writers were my mentors, so to speak. Books like Tuesdays with Morrie, The Five Dysfunctions of a Team, The Traveler’s Gift, Quiet and Awakening the Sleeping Giant (among many others) became guides for my life. Then, technology advancements brought me podcasts (ie, Michael Hyatt, Dan Miller, Andy Andrews, Entreleadership, Chris LoCurto). From these podcasts I can get daily inspirations and perspective from those who have walked paths I haven’t yet walked, but will. They provide answers from people who are passionate about helping others. It was a podcast that led me to the doors in Franklin, TN where my life would be significantly changed as I took part in Chris LoCurto’s LifePlan event. And, Twitter allows me to connect (on some level) to others who have a story and a message that provides further perspective. It’s no exaggeration to say that there are days that the tweets I see coming from people like Joel Fortner, Chris LoCurto and Bruce Van Horn are exactly what I need to “hear” to wake me up. See this post for some of those tweets. And recently blogs posts from Matt Ham have played a role in my life. And, all this technology has given me the opportunity to have short conversations with people who can add value to my life. People I never would have been able to connect with before. We are all connected more than we ever have been before. One person’a journey can now significantly impact another’s journey. Of course, we had that before technology, but the opportunities for it now are only limited by those that don’t engage. And, you don’t have to be an established coach or thought leader with a tribe. You just have to have a message a story or a yearning to choose growth. We all struggle. We all have the opportunity to overcome. We all have a story. Now, more than ever, we have the opportunity to overcome. Connect, because we are all stronger by sharing our message and gaining perspective through our own life and the lives of others. I encourage you to click on one of the resources in this post or seek out your own. These are just ones that have impacted me. Find someone who has a message that resonates with you and connect, engage, learn and grow. Or, even consider sharing your own story. Don’t discount the power your story can have on someone else’s life. One of my key strengths is listening. Typically, it’s in regard to conversation, but today it’s in regard to listening to one’s life. When I first read about listening to your life in Jeff Goins’s book The Art of Work, it really stood out to me. I instantly knew that’s what I needed to do. 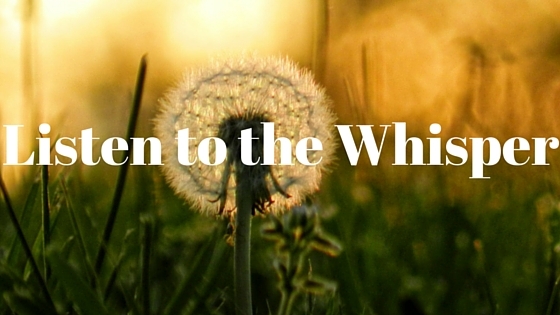 What does it mean to listen to your life? That’s a question that could be a post in itself, but for today, it specifically means listening to those statements, oftentimes singular, but powerful statements, that are said to you that could profoundly change your life. The statement above about focusing on just the next step is one of those statements. The summer has brought a lot of contemplation about the future. So much so that I consistently awake in the middle of the night. I’ve never been one to do this. I wake with nothing specific on my mind, which causes me confusion as to why I keep awakening. I do think it’s in regard to the future, the enormity of it, what I want and need it to be, the possibilities that exist and the actions I need to take. 1) I want a marriage that is solid, strong and one that builds each of us up so much that we can them help one another, our kids and others. 2) I want to significant impact others so that they can live their best life. 3) I want to seize every moment with my son because I know the moment he is little is brief and precious. 4) I want to give all that I need to, all that I’m supposed to, before I die. Though I think it’s important to take on those thoughts, it can cause us to lose sight of the next five minutes. Take a listen to this podcast with Matt Ham and Robert D. Smith. Robert speaks about it in a way that one can’t help but listen to. Here’s what I believe: If we apply this concept every day, all these small moments will lead to those big moments in life we want to accomplish. In fact, I would argue, it’s those small moments we need to celebrate because that’s when the change happens. That’s when we affect lives. That’s when we live our best life. 1) Awake early so that I can have reflection and refuel time. 3) Eat a breakfast this is a good balance of protein and fiber. 4) Have a focused and intense work session tonight to prepare for delivering professional development next week. 5) Proactively make the interactions with my husband in a way that shows that I cherish him. Choose not to let the stress of being the wife of a business owner negatively effect me. 7) Choose patience, love, and light-heartedness as I interact with my son. Know that it’s not the amount of time I get with him, but the quality of the time I do. 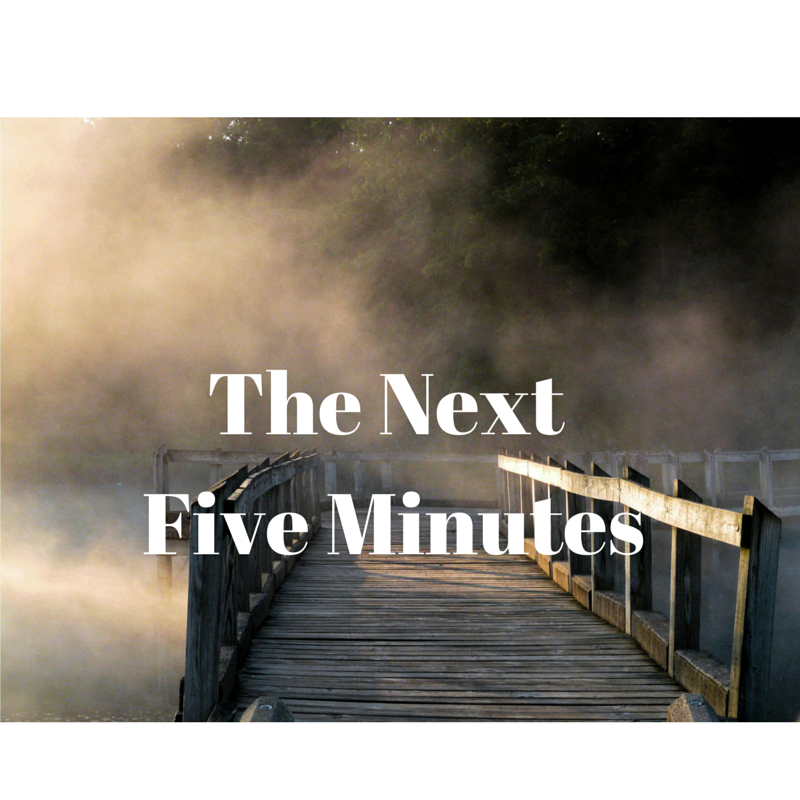 What will you do with your next five minutes today?